I had blueberries left over from my Blueberry Cheesecake Ice Cream and a new square bar pan, so I decided to hit up allrecipes and find a recipe. I located one for a Blueberry Buttermilk Coffee Cake. 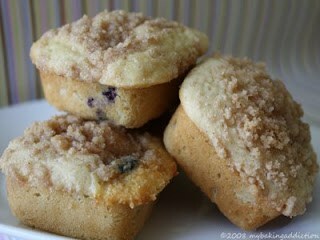 I had all the ingredients on hand, so I thought I would break in my new pan and whip up some blueberry crumb muffins. These babies poofed up quite a bit, but luckily there was not an overflow catastrophe! The overall flavor was good and the texture was great. I did add a heaping teaspoon of cinnamon to the crumb topping just for added flavor. Honestly, I think they may have been a tad bland without the cinnamon. I used the recipe as written and it yielded 28 muffins. 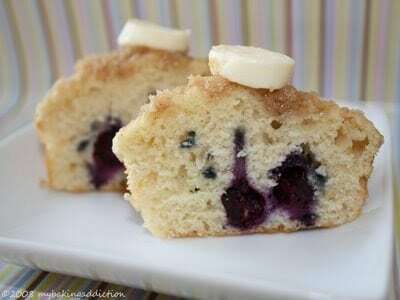 If you are interested in this recipe to use up those blueberries in your fridge, click here! If you are even more interested in the rad square muffin pan, clickity click here. I think the pan is really a good buy for the price, it has a nice weight to it and everything popped out nicely with a spray of Crisco Non-Stick Cooking Spray with Flour (this stuff is awesome). I think I am mildly obsessed with this pan, so I am sure you will be seeing many more desserts whipped up in this baby! I’m super glad you got that pan – we’re even more twinsies than ever! Baaaahahahaha. Mine is tan-ish in color and I believe it’s made by Calphalon. Hope this helps.